Rather than go big, Ant-Man goes small, and the Marvel Cinematic Universe is all the better for it. There was some scuttlebutt surrounding the production that made the rounds. Edgar Wright, the writer-director of Shaun of the Dead and Scott Pilgrim vs. the World, left over creative differences and the vacancy was filled by the guy that did the Kirsten Dunst cheerleading comedy Bring It On. That doesn’t sound like a good replacement, but director Peyton Reed proved to be a worthy fill-in. As a hero Ant-Man may not reach the heights of Captain America or Spider-Man on the Marvel superhero totem pole but this character moves at a different beat; heavy on the sarcasm and sticking his foot in his mouth. Scott Lang (Paul Rudd) gets released from prison having just served a stretch at San Quentin. With a Masters degree in Electrical Engineering, Scott finds it hard to hold onto a job as employers frown if you check no to having ever being convicted of a crime. No job and no child support means less time he gets to spend with his daughter Cassie (Abby Ryder Fortson). Feeling desperate, he agrees to do a heist with his old prison cellmate Luis (Michael Peña). Cracking the targeted safe doesn’t bring the payout they were expecting – just a peculiar costume. It doesn’t take long for Scott to find out the suit’s special trait: shrinking him to the size of an ant. All of this, the idea for the heist and the contents of the safe, was orchestrated by reclusive businessman and inventor Hank Pym (Michael Douglas). He has kept his miniaturization formula hidden for decades, including his own company Pym Technologies and away from S.H.I.E.L.D., fearing how it would be used. Now Hank wants Scott to don the suit and stop his company’s new CEO, Darren Cross (Corey Stoll), who has invented his own version of the formula and created the Yellowjacket. 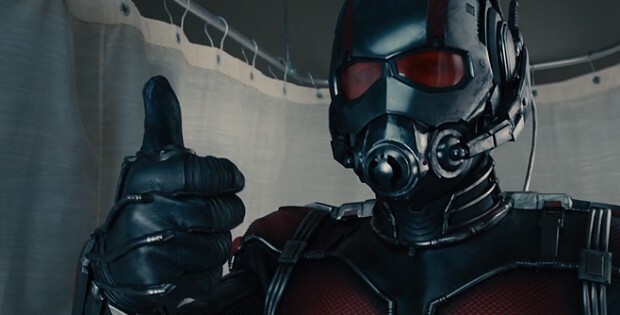 Ant-Man isn’t a breakthrough in the Marvel film cannon, and it doesn’t aspire to raise the bar. That’s perfectly acceptable. Without the added weight of exceeding expectations the movie follows the MCU playbook of predictability by having the hero trying to prevent the villain of obtaining or using an object for nefarious purposes while having a bit of fun along the way. Ant-Man plays to its strengths as a caper comedy with action mixed in moving the story along with quick observational humor about Baskin-Robbins and James Cameron’s Titanic and my favorite, Thomas the Tank Engine. The movie carries a big sense of adventure inside a tiny world when Scott shrinks down and becomes Ant-Man. Not yet accustomed to the suit’s powers, Scott has to get himself out of a bathtub, hangs on to a record’s grooves as a DJ spins some sick beats, and avoids being swatted by a rider on a trolley. The casting of Paul Rudd as Scott Lang is yet another casting win for Marvel Studios, who has a strong track record of picking roles. There was a time when Robert Downey Jr. was thought to be a risk as Iron Man, after all. Rudd’s crack-wise wit as Scott Lang makes me hope he has a least one moment in a future Marvel movie where he and Tony Stark trade barbs. Most of the supporting cast plays their parts well; though Stoll is not quite a menacing presence. The scene-stealer by far is Michael Peña as Luis. He is perfect in the comic relief role. Another benefit is the use of Falcon (Anthony Mackie). A few more scenes with him would have been warranted, especially to get Captain America’s reaction to him getting thwarted by an ant…man. Because you know Cap is going to find out somehow. Ant-Man looks and sounds great on Blu-ray. The 1080p image is very smooth and clean, especially the detail of the costumes or dust in the air. The colors are also slick, especially an early scene where Scott is wearing the pink and blue Baskin-Robbins uniform. For such a small character, he gets one hell of a soundtrack. DTS-HD Master Audio 7.1 lossless. Action scenes are enhanced with the surrounds as the subwoofer gives the music a nice robust sound. Other highlights include the rushing bathtub water and the vicious fight in the briefcase that sounds tiny in the cramped space and then becomes louder when the action switches to normal view. The deleted and extended scenes section contains eight scenes (“Fixing the Cable,” “Hank Vaults the Suit,” “Paxton and Gale,” “Qubit Defense Matrix,” “Scott and Cassie,” “Wish Fulfillment,” “The Future of Pym Patricles,” and “The History of Ant-Man”) with optional commentary with director Peyton Reed and star Paul Rudd. Completing the special features is a quick three-minute Gag Reel, Sneak Peeks of other Marvel Entertainment-related properties and an audio commentary. For the commentary Reed and Rudd cover the production in total, from shooting locations and character development, to alterations made in the story after Edgar Wright left the project and the script he co-wrote with Attack the Block’s Joe Cornish was updated by Adam McKay (Anchorman, The Other Guys) and Paul Rudd. Early on it looked like Ant-Man was going to flop, but Marvel Entertainment is a powerful company. Even as audiences start to tire from comic-book movie overload, here comes another hit. Ant-Man is not Christopher Nolan’s The Dark Knight or Captain America: The Winter Soldier. But it is a fun, entertaining movie. The plot is repetitive and lacks drama, but credit Peyton Reed for taking Edgar Wright’s story blueprint and making a lesser-known superhero and Paul Rudd into a credible hero that likes to burgle. As for the Blu-ray, it delivers on the technical presentation even if the special features package is average. Still recommended. Buena Vista Home Entertainment and Marvel Studios present Ant-Man. Directed by: Peyton Reed. Screenplay by: Edgar Wright & Joe Cornish and Adam McKay & Paul Rudd. Starring: Paul Rudd, Michael Douglas, Evangeline Lilly, Michael Pena, Corey Stoll, Bobby Canavale, Anthony Mackie and Judy Greer. Rated: PG-13. Running Time: 117 minutes. Released: December 8, 2015.